The Godfather is the perfect example of a movie where everything just comes together to create a masterpiece. From the performances, the direction, the music and the overall development of the “real” central character in the story. It is many of the actors’ best performances and the argument could certainly be made for it being Al Pacino at his best. In fact, what I like is how “not” Al Pacino he is in this movie. Michael Corelone is the quiet, sensitive and least mob-like member of the family. The guy who gets the job of cooking rather than actually being involved in “the business.” We don’t get any of Pacino’s now classic shouting, scowling or what feels like over-acting. In the key scene, the biggest development in Michael’s character, set in a restaurant, it is his intensity with complete silence and focused eyes that sells how important that moment is and also offers up probably the best scene in the whole film. That is quite a plaudit too because the movie is made-up of great, momentous moments. The opening wedding has so many parts, seemingly inconsequential but impactful conversations and offers the perfect introduction to the now legendary performance by Marlon Brando as the titular Godfather. It is a great performance. The choice to practically whisper his lines is genius and he offer so little in his dialogue, only saying what is absolutely necessary to get his message across. This means that when he does erupt or show any real passion, it has so much more of an effect and demonstrates the real power and influence that this character has. Considering the film bares his name and has him as a key character, Don Corelone is in it so little. 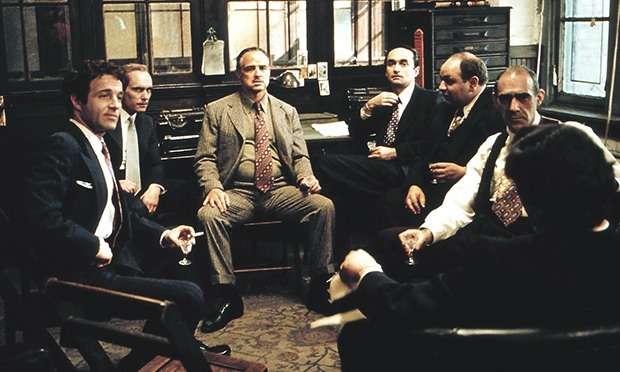 It is all Michael Corleone’s story but he is ably supported by other actors at their best. James Caan’s Sonny offers a great counter-balance to Pacino while Robert Duvall gives an understated but excellent performance as Tom Hagen. To say this could be those individuals best performances is no understatement and couldn’t be dismissed without argument. This could well be down to the great story though. It is epic but not just in length. At three hours long, it could have felt bum-numbing but the pace of the tale keeps your interest. From New York, to Sicily, to Vegas, from wedding to wedding and the great finale with a Christening as the backdrop, The Godfather tells almost a trilogy of tales in one sitting. It could be a good lesson to the studios splitting third movies in franchises into two (although I wont compare Hunger Games to The Godfather). 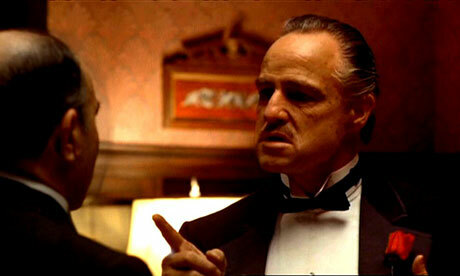 That The Godfather is the beginning of a trilogy is never felt. It doesn’t feel like an incomplete story or that it is calling forward. As a trilogy based around family drama rather than Sci-Fi or Fantasy, you never feel like anything has been left for the remainder of the movies, like often is the case in films today. Overall, The Godfather is rightly lauded as a masterpiece and combines an epic story, brilliant characters and great performances. Al Pacino is at his best, as is arguably Robert Duvall and James Caan. It is Marlon Brando that steals the show as one of the most iconic characters of all time – with a subtle but mesmerising performance as the titular Godfather. A stellar review of my favourite movie. You really captured the essence of it. Thank you for that, it’s difficult to review a film that so many have seen and is clearly recognised, rightfully, as a classic. You did the film a lot of credit. I read this book when I was way, way too young and loved the movies. Fell right in love with them. Great write up. I’d be tempted to go back and read the book. I’ve heard the film follows it closely though.